RAINBOW BACKLIGHT & ADJUSTABLE BACKLIT MODES: The rainbow backlight gaming keyboards creates cool gaming atmpshere,and brings fantastic gaming experience.You can adjust the backlit modes from permanent lighting mode to breathing light mode by pressing "FN" and "LED" key simultaneously.Turn on/off the backlight by pressing "LED" button. 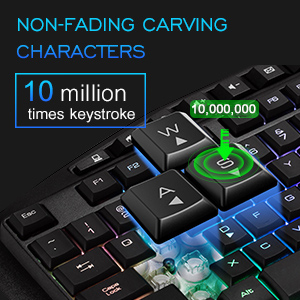 POWERFUL FUNCTIONS FOR GAMING: Built-in anti-ghosting technology, this keyboard can access to press multiple keys simultaneously.14 independent multimedia keys make it easier to access media controls instantly. Pressing "FN" and "WIN" key simultaneously can lock WIN function to avoid interruption in games, offering a professional and strong gaming feeling. ERGONOMIC AND ANTI-FATIGUE DESIGN: Based on the ergonomic surface, this backlit keyboard ensures natural and comfortable using experience. The keycaps is pluggable and larger than other gaming keyboards. 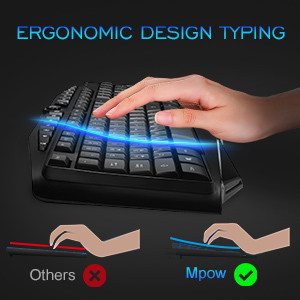 Extra wrist rest is attached to reduce typing fatigue. ADJUSTABLE BACKLIT KNOB: Equipped with a adjustable backlit knob, which can be used to adjust backlit brightness and turn on/off the backlit to eliminate light pollution.Press "FN" and "W" key simultaneously allows Arrow keys and WASD keys interchangeable. Cool appearance with smooth and clear line, especially suitable for games, study or work. Perfect for you to enjoy all kinds of fun or study. The carving colored keycaps allow character transmission effect. without worrying about dust and smudge. The anti skid wrist rest helps you to reduce fatigue while playing games. 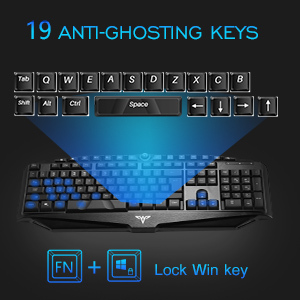 With 19 anti-ghosting keys,the signals simultaneously sent by these 19 keys won't be confused. Locking the function of "WIN" by presing "Fn" and "WIN", no need to worry about the interruption in the games. Press "Fn" and "Win" again, it will restore the "WIN" function. Press Backlight knob to adjust the brightness of lighting. Press LED key to turn on/off the 7-color lighting breathing. Press FN+LED to choose the permanent lighting mode or breathing light mode. With 14 Multimedia hot keys, this keyboard makes it easy to access to Music, Play/Pause, Volume, Internet, E-mail and so on. Press "FN" and "W" simultaneously, the WASD Keys and Arrow Keys can be switched freely. No driver needed, you can simply connect the USB cable and computer, then you are ready to use it. Compatible with Windows 2000/ME/XP/7/8/10, Vista, Mac. Note: The shortcut keys are NOT available for Mac.